GEORGIA -- Athens-Clarke police said Friday there will be no criminal charges in connection with the mauling of a jogger by three dogs. But the man who was caring for the dogs at the time of Sunday’s attack still faces potential jail time for violations of county animal control ordinances. 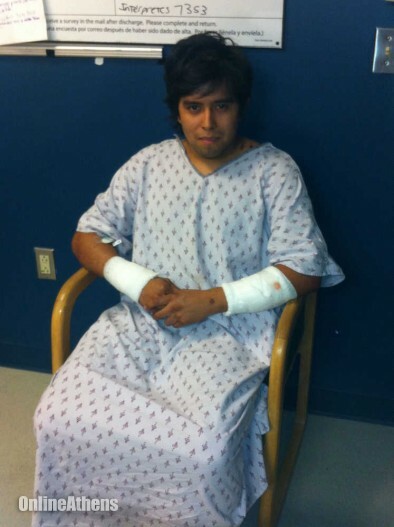 The victim of the attack, 26-year-old Bertildo Montez, suffered more than 60 bite wounds when mauled by the dogs, described by police as pit bulls. He remained hospitalized until Thursday. The man who will be charged with violating county ordinances is not the owner of the dogs, said Athens-Clarke Animal Control Superintendent Patrick Rives. The actual owner is a homeless man, but 57-year-old Lamar Johnson was caring for them while the owner was in jail, he said. The homeless man lived in a makeshift shack on Johnson’s Freeman Drive property. According to Rives, Johnson will be cited with three counts each of failure to control a dog and menacing a pedestrian using a public way, and two counts of unlawful tethering. Each infraction carries a maximum penalty of up to six months in jail and a $1,000 fine. Even though Johnson isn’t the dog’s owner, he was responsible for the animals while acting as caretaker, said Rives. The Animal Control superintendent said he did not know how the dogs came to be loose at the time of the attack. Animal Control officers took custody of the dogs following the attack and are prepared to declare them as “vicious” under state law, according to Rives. They will remain under rabies quarantine until Wednesday, he said, after which time they will be euthanized.